To a DIYer, an estate sale is even better than shopping at say, the Mall of America. So much promise, so much possibility. "What were they selling? Was there anything good? Where were they at? When do they close?" The questions tumbled out of me in rapid succession. The response? A typical male (sorry guys), no details answer..."nothing good". Mr DIY did a little dumpster diving on his way home! He pulled this out of the trash for me. 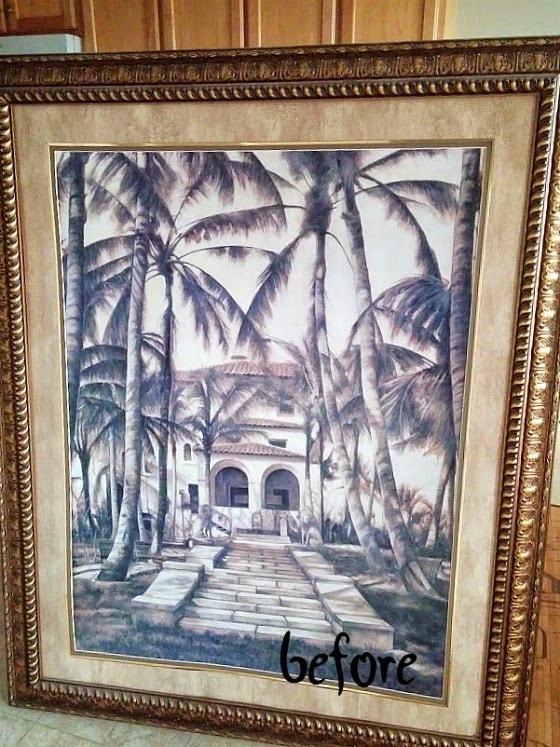 An enormous ornate gold frame with a cheesy palm tree print. ...however, I've already done that. I wanted to challenge myself to do something completely different. I decided to paint an abstract over the print, and keep the frame in its original gold. So Mr DIY helped me pop the print out of the frame. Unfortunately, the ugly mat was glued to the print and when I peeled it apart, it took some of the print with it. No problem! I wanted texture anyway. 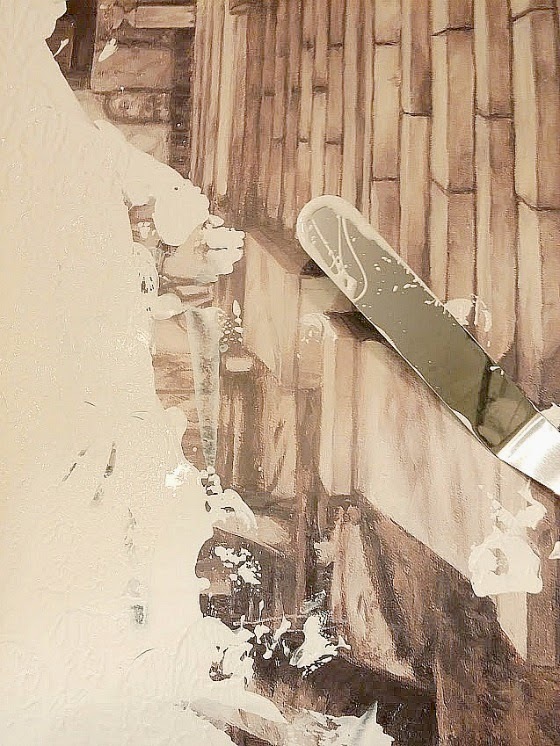 I poured leftover latex wall paint directly onto the mat and spread it around with an offset spatula! YES I DID! It worked just like a trowel and spread the paint much faster than a brush would have. I got a nice, thick coat to add to the texture and rather than trying to smooth it, I pounced the spatula over the paint, creating little ridges and bumps. 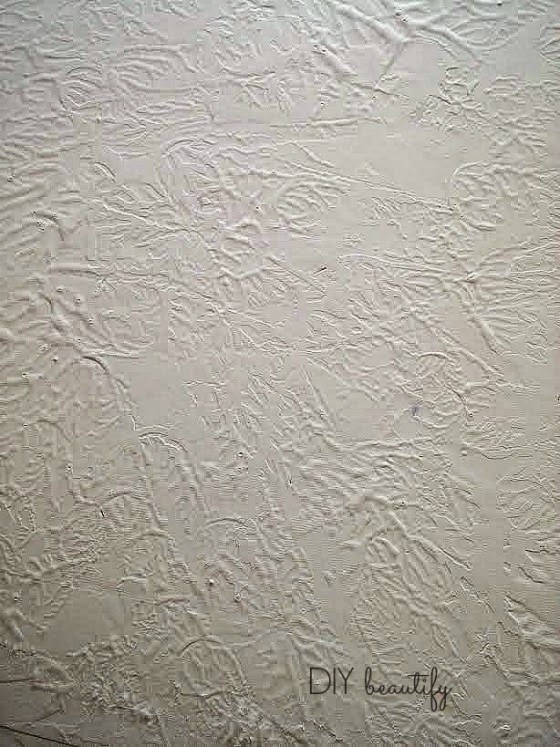 I was thinking that when it dried, it would be a nice textured surface for the modern abstract painting I intended to do. Here's a close up of the texture I achieved. So much more interesting than a flat, painted surface! I let it dry overnight and in the morning I finished my abstract painting...in about 30 minutes! Really! 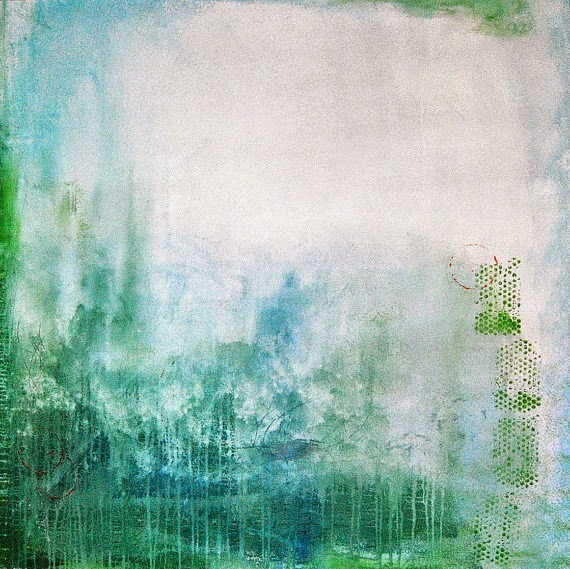 This was my inspiration piece, Into the Mist by Samos...I love the colors! Rather than using several paintbrushes, I grabbed my offset spatula again to apply my paint. 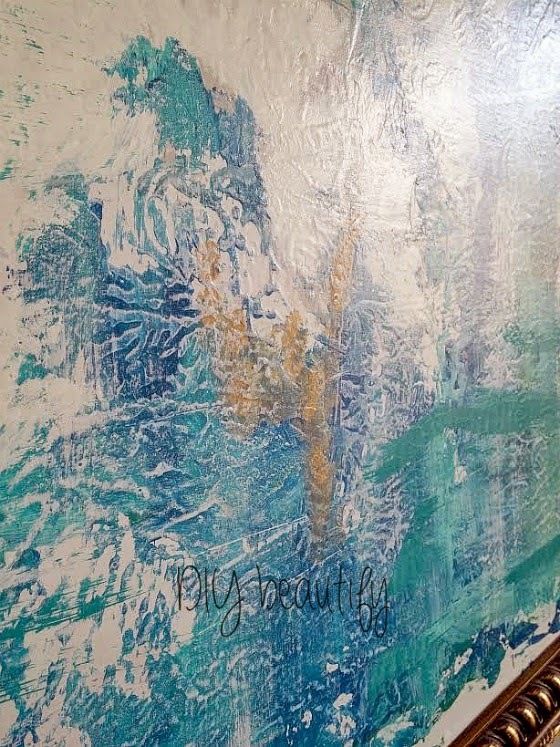 I simply squirted colors on the canvas where I wanted them and then blended and spread with the spatula! The aforementioned texture meant that the background still showed through in spots, which I loved! I started with my lighter gray and white, I ran out of white so didn't get quite the brightness I was after, but that's ok...it's ART...there is no right or wrong, lol! It was surprisingly easy to do! In between colors, I wiped my spatula clean. Once I had my color applied, I went back with a brush and dabbed on some gold in random places. I thought the gold would add nice contrast as well as help it tie it to the frame. Are you ready to see the finished painting? I'm hanging it where my large ornate chalkboard used to be rather than leaning it on the fireplace and having two competing focal points in the room. I moved the chalkboard up to my bonus room and I'll show you that update in a few days. I'm in love with my art!! 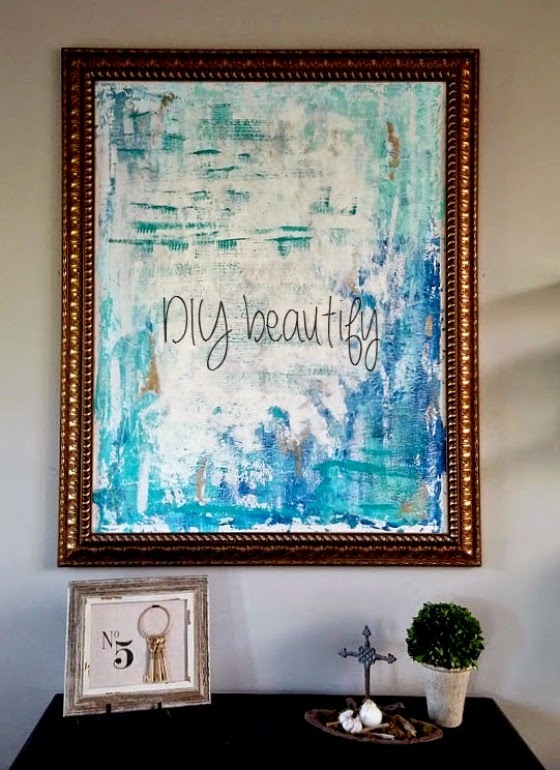 It's bright, colorful (while still staying true to the colors in my home), and it is a HUGE statement piece!! I forgot to mention that once everything dried, I painted an acrylic sealer over it. That's what gives it the pretty sheen. This was so easy! I never would have thought so, but it really was. All the paints I used were acrylics except for the first layer, and that was only because I knew I wouldn't have enough acrylic paint to cover the original print. For a large piece like this, the offset spatula made all the difference! It was fun to paint with it and I love the texture it created! 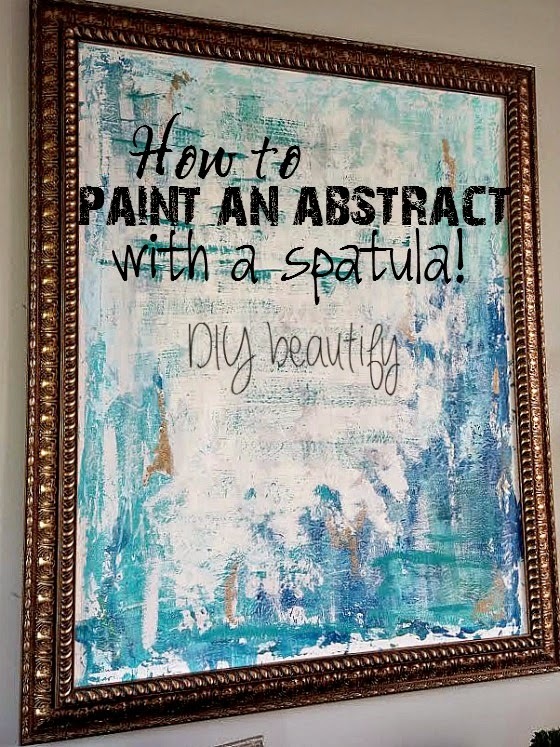 I love that my DIY abstract painting is 100% unique...NO ONE else has this hanging in their home! I really hope you'll give this a try sometime. Patterns and graphics are really neat, but they're trendy and will pass in time. My abstract art will be "in" for a long time. I'd love your opinion on keeping the frame gold. Do you like it? Would you paint it? How lovely! YOu make it seem so easy, but I think you have to have a great eye for color, which you obviously do. Found you over at Anything Blue. Thank you for sharing your talent there! Thank you Danni! So glad you stopped by! I absolutely love this! You did an amazing job, and it looks like really expensive modern art. I think you should definitely keep the frame as is...it's perfect! hanks for your encouraging words and your input regarding the frame Julie! I sure appreciate it, as well as the shout-out you gave my project on G+. Have a wonderful weekend!! Hey Julia, it was difficult to stop fussing with it, I had to finally walk away and say "done" - and my hubby knows to never do that to me again, lol! Thanks for stopping by to comment! Love! It looks just like those mass produced prints I see often for big bucks, but way better! Wow! 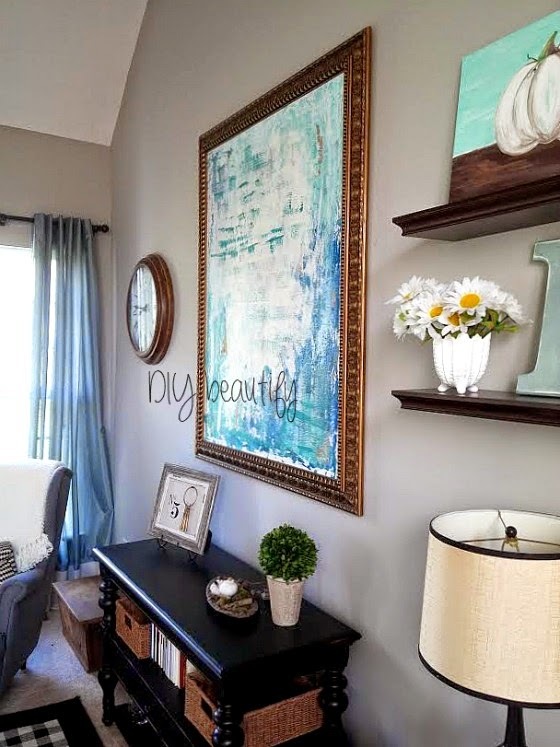 Your painting turned out amazing! It's one of those projects that I always consider doing but always chicken out on. Your project is very inspiring. If you're looking for another place to share your projects, I would love to have you stop by Etcetorize and join our Make it Monday party. Wow, this is gorgeous! Love the colors you chose and that you just went for it and created something beautiful :) Found you at What we accomplished Wednesday! Thanks Erica...I had nothing to lose, so it was fun to create without any pressure :) So glad you found me, I hope you stop back! !